Well, um, I’ve never actually held my grandfather’s hand. Not in that intimate familiar we-are-chums way. I’ve only held his hands to help him walk. I guess I’ve really only touched his hands, but I like to imagine that we’ve held hands. I like to think that I’ve inherited something more than lost hopes, thwarted aspirations, and fractured dreams. 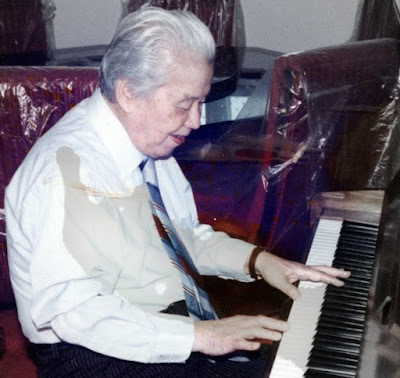 I want to feel that I have a direct musical lineage to China through my grandfather, a musician and teacher before my grandparents fled China in 1938, but I don’t. I find Chinese music in faded, hardcover books in the remotest stacks of the library. As the only composer in a family of overseas Chinese, it is with regret that I never studied music with my grandfather.